Fiore - eco-leather bar stool, chrome legs. Suitable for home, kitchen, living room, office, bar, pub, shop, restaurant, hotel, pizzeria, hair salon at the best value for money. Our bar stools are sturdy and modern, with an original design and comfortable seats. Rotating and adjustable seat, lined, chrome-plated base, to protect the floor from marks and scratches. Adjustable height: from 43 to 57 cm. Total height: 73-87 cm, Backrest height 33 cm. Width: 67 cm. Seat size: 32 x 35 cm. Base diameter: 45 cm. 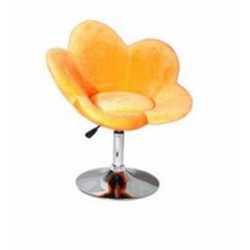 360 ° swivel chair. Weight: about 7.4 kg.